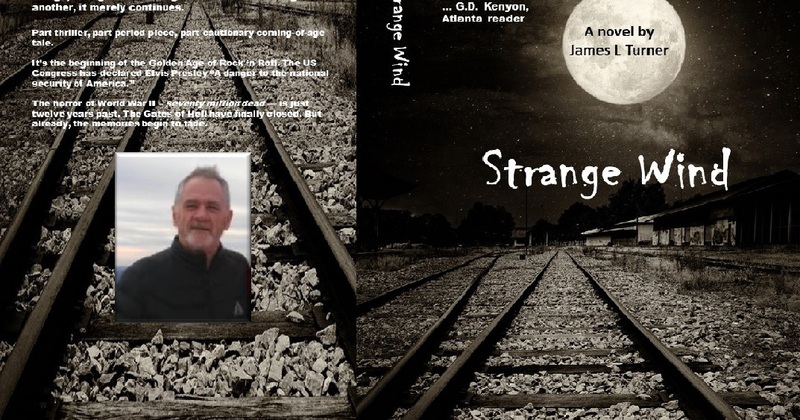 Ottawa author James Turner has recently published his first novel, Strange Wind, a thriller combining memories of his childhood spent in Old Ottawa East with historical elements of the Second World War era. The Mainstreeter talked to Turner to find out more about his writing process, his childhood in our neighbourhood and the inspiration behind Strange Wind. Ottawa author Jame Turner has recently published his first novel. Strange Wind, which is set in Old Ottawa East. What was it like to grow up in this neighbourhood at that time? Does it match the poetic description of life here in the 50s that you give in the beginning of the book? I grew up in Old Ottawa East, on lower Lees Avenue. From kindergarten to eighth grade, my siblings and I, all ten of us, went to Canadian Martyrs Catholic School on Graham Avenue. (That building is still there and looks exactly the same. I believe it’s the Adult High School now.) We were officially part of Ottawa East, but isolated by the railroad tracks. And I did my very best to capture life in that era, exactly as I recalled it. What inspired you to put pen to paper and write the story? A lot of the inspiration came from my siblings. Seems that each of us has our role in the family. My eldest sister Josephine is the family historian, while I’ve ended up, by default, being the family scribe. Several of my siblings have urged me over the years to write a book. For the most part, they wanted to read about our neighbourhood and what it was like growing up there. I’m not sure they’re totally happy with the results, though. I think they were expecting our family version of Angela’s Ashes. I don’t think they were prepared to have me rattle a few of our family skeletons in public. But those skeletons are real, and part of my overall intent was to shine a light on the universality of those evils. So I left them in. have only a surface understanding of events – Hollywood’s version. I’d like to demonstrate that these evils are universal, timeless, and recognize no geographic boundary – that, regrettably, the Nazis were not a one-time aberration. The narrative orbits around a factory near the Rideau River, where some German POWs are working in the aftermath of WWII. Is this something that actually happened? [Turner recalls that] the Harry Hayley Cinder Block Company did employ German POWs during, and after WW II. There is little or no public information readily available on this. My eldest sister has clear memories of watching a flatbed truck deliver the prisoners each morning, then returning them to the prison camp, in Hull, in the afternoon. The book plays a lot on the trope of truth versus fiction. There are some parts that seem autobiographical but there are also archival photos, maps, and extensive footnotes and end notes. To what extent was the book based on true or autobiographical events? I’ve been asked this question many times. The novel is, in general, autobiographical. The main story elements are based on factual events, the characters are real people with, of course, some dramatic and narrative license employed. As one example, the chapter where the narrator (me) is chased by one of the main villains actually occurred. Writing about it was basically simple reporting, up to the time I escape. Everything subsequent to do with this character is fiction. The photographs, and other historical data, are tools that, I believe, lend authenticity to the tale. The research provided in the footnotes and endnotes is quite extensive. Was there a search to uncover some sort of truth, or to present the “real” facts that have been forgotten by history? Was this inspired by the current political climate? In the first draft, I did not employ endnotes. Most of this information was woven into the novel. But on review, I found that it interfered with narrative flow. Hence, the end notes. Why did I include these elements? Since childhood, when I began reading, I’ve been fascinated by WW II, particularly the events of the Holocaust. The numbers and statistics from that era have always astonished me. In fact, I’ve never been able to view them as “statistics” – always been cursed/blessed with mentally picturing the reality. In researching that era, I was stricken by the many similarities between pre-war Germany and modern America. That research also brought to light similar, unflattering events from Canada’s not so innocent, but colourful, past. Strange Wind can be found on Amazon.com in print and ebook. It’s available on Amazon.ca as an ebook.